London is full of amazing places to eat, but when it comes to truly romantic restaurants people are often slightly stumped for where to go. In my opinion, romantic restaurants should have certain qualities; they should have something special about them that makes a wonderful talking point – whether that be a great view, some unusual ambiance or some rustic charm. They should certainly be somewhere where conversation can flow easily, where nobody has to shout, nor does anyone worry they might be overheard. The food quality must be flavourful but feel slightly decadent. You want to feel when you go to a romantic restaurant that you’re being slightly spoiled (or are doing a bit of spoiling), eating something far more special than you would rustle up at home (unless you’re a really good cook unlike moi). 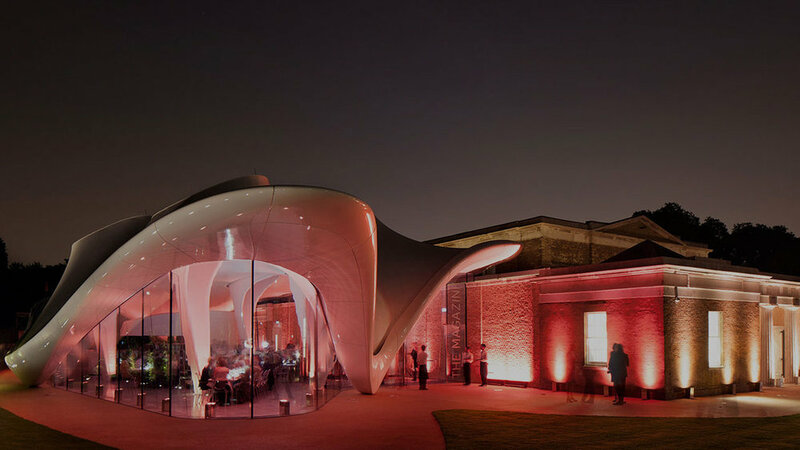 Forming part of The Serpentine Galleries The Magazine is a wonderful space-age style restaurant for you and a date to enjoy after perusing the galleries. It’s a bit of a hidden gem and the architecture and design is really quite something too. Having opened in 2013 The Magazine was designed to be a little bit different and whilst it’s usually only open until 6pm (the opening hours of the galleries) for a spot of lunch and afternoon tea, in the winter and spring months there are some wonderful immersive performances called ‘Magazine Sessions’ taking place in The Magazine too which are super romantic which take place throughout dinner until 10pm. These events range from music and theatre performances to immersive environments. It’s a very unusual idea for a date and after dinner, it’s nice to take a stroll around the lake too just to finish off the evening beautifully. Watch out for the next Sessions in November and December, otherwise, it’s a still a wonderful date venue for a lazy afternoon. For those in search of something romantic yet more central there is the fabulous Quaglinos in Mayfair, which is fairly recently revamped classic. The atmosphere can vary depending on when you go as it can get very buzzy on weekends when there’s live music, but during the weeks it’s a delightfully romantic spot with dramatic drapes and a sparkly stage. The seafood cocktail, which is a mixture of lobster, langoustine and crab is perfect for sharing and after dinner you can choose from two super-glam bars for a tasty cocktail. This place is glitzy, sleek and beautifully designed. It combines atmosphere with elegance well for a memorable romantic evening. If you’re after less glitz and more traditional charm then it would be remiss for Maggie Jones not to make the list. A Kensington classic for over 40 years (and the sister restaurant to Le Poule Au Pot) this little gem is styled like an old barn, with trinkets and dried flowers adorning the walls the atmosphere is cosy and informal, and the food is unfussy – think fillet steaks and heart-warming roasts. It’s a very romantic setting as the seats can be pretty close together, despite the restaurant layout being over three floors in the style of an old townhouse. Those who come to Maggie Jones are often old regulars, which says a lot for its reputation and indeed the fact it’s been going so successfully for so long. For those seeking something truly different who want to make quite the romantic gesture, then you really must try some of the dinners from the rather clever Gingerline team. I recently enjoyed their Chambers of Flavours and it was quite something. Offering multi-dimensional dining in secret locations in London (only revealed on the evening of your dinner) this is quite the experience, and an absolutely amazing way to spend an evening. From setting off your dining experience in a log flume, each course you’re led into a different experience from a bird’s nest, an old haunted house, a science experiment and an aeroplane! Tickets book out so quickly but as soon as they become available book up months in advance for you and your date, they will be impressed. Set on a quiet terrace surrounded by vines and hedges Dalloway Terrace is a beautifully presented little gem in Bloomsbury, within the Bloomsbury Hotel. With a retractable roof and heating it’s perfect whatever the weather, the restaurant and bar is peaceful and charming and feels like a little secret garden in the middle of the city. Seasonal British food is served all day and afternoon teas are also proving very popular. They are also soon to be launching a film club from the terrace (in conjunction with Nomad cinema) so from 22nd September you and your date can dine while watching The Great Gatsby, Cocktail, Chocolat or The Grand Budapest Hotel. For an elegant and refined dinner for two, the two Michelin starred Marcus in the Berkeley Hotel is a perfect choice. The setting is smart and secluded and due to the unusual oval tables you and your partner can sit next to each other. Whilst that means you can’t stare into each other’s eyes that doesn’t matter one bit, as you can still share not just the food but also the whole experience together. In fact the word ‘experience’ really sums up Marcus as the set menu can last a good two and a half hours of truly incredible food. The extensive wine list is impressive too, as is the knowledgeable sommelier but the restaurant manages to avoid being overly stuffy. A classic spot for afternoon teas the Winter Garden is also a perfect setting for a relaxed romantic meal. Set within the centre of the Landmark Hotel in Marylebone, in the Winter Garden you’ll find a huge glass atrium with decadent palm trees, marble staircases and soaring columns. There are certainly plenty of talking points, and always a rather suave and easy Sunday looking crowd. The atmosphere is peaceful and serene and to make the most out of the incredible natural light, opt for the Champagne brunch or lunch. It’s a place conducive to long conversations as the pace is unhurried and calming. It’s only when you step outside back onto the hustle and bustle of Marylebone that you remember where you are.